ON a breezy Spring day we fly out of Sydney through the Heads – almost feels like we are sailing away instead of looking down from the pointy end of a 747-400 ‘Fraser Island’. The name seems to make a personal connection to our coastal Queensland home – we will be safe on this first step in our journey which will take us from Ecuador to Patagonia during August and September. It is the same date but seems like an eternity since leaving Sydney. A stunning sunrise over the Southern Ocean will be one of the ‘wow’ moments to remember; then as we fly closer to our first destination, gradually the coastline of South America is revealed. The snow covered Andes are there too and will be a backdrop to many of our days from Ecuador’s Tren Crucera trip and later when we travel in Chile. Santiago is just a stop over today – we will return in October. The arrival in Guayaquil in the evening was initially reminiscent of a first experience of other balmy evenings in Hawaii or Mauritius. The same soft, warm air and soft calls of birds and frogs. During the day Guayaquil downtown and the Malecon provide a glimpse of the city and the extensive recreational and commercial development on the bank of the river Guaya. Horns blaring, families out to wander through the malls of the Malecon and the city streets, a few stray cats, and stalls holders setting up for weekend activities. There are some lovely trees and garden areas and some gracious, if faded remnants of old buildings facing the river contrasting with the utilitarian, unattractive and rather grubby city centre. It is too warm (31C) and we retreat to the hotel to recover from jet lag. Interesting to drive to another suburb of Guayaquil for a private lunch today. Samborondon is over the water via a bridge and we are dropped back into 21st century suburban life complete with mega malls , gated communities and estates with middle class families, dogs and kids on bikes. The discussion ranges from options for university, estate facilities, jobs for classes of workers, holiday plans, work and lifestyle and Australian crocodiles, sharks and snakes as well as our beautiful beaches. Time to pack for tomorrow’s flight to Quito and to ‘La Sierra’ and Tren Crucera. TAME were very efficient and it was surprising that Guayaquil airport was open, airy and not at all crowded. Our Tropic guide in Quito was very keen to get us to the car as quickly as he could. The new highway was fast – with police every 200m – we learned later WHY. Hotel Patio Andaluz was full of character, a quiet oasis in colonial style with wide verandas, heavy timber furniture and interesting art pieces – and very tiny bathroom. There was a little confusion initially about the early departure the next day but a breakfast box was arranged. Before lunch we walked to the Presidential Palace through ranks of police, barricades and crowds of locals and discovered that the square had been taken over by a huge rally. There was a meeting of the presidents of Bolivia,Venezuela, Columbia and Ecuador’ Correa. Lunch was in a cafe in a side street away from the crowds and opposite the partly restored Simon Bolivar Theatre. Another foray in the early evening took us to the San Francisco museum and convent. There was a thundery sky so back to the hotel for a cocktail in the garden courtyard. That did little to steady the dizziness from the high altitude. ( Quito is 2850 m above sea level). Dinner there was pleasant in the central courtyard. We saw glimpses of Cotopaxi emitting ash as we drove in the bus to the northern Andes and the White City of Ibarra. 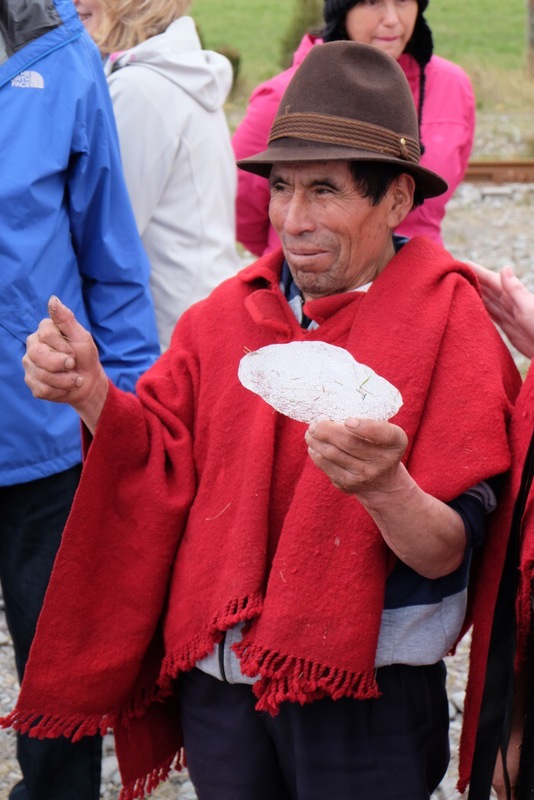 Aboard Tren de Los Lagos to Otovalo with excursions to artisan wood carving (photo Le Diable) at San Antonio de Ibarra and Fabrica Textil Imbabura. Off the train at Otovalo and lunch at Puerto Lago Lodge which was a breezy location right on San Pablo Lake. There was a very LONG bus trip back to Quito. We were absolutely exhausted but joined in the ‘special’ dinner in the restaurant at Hotel Quito. 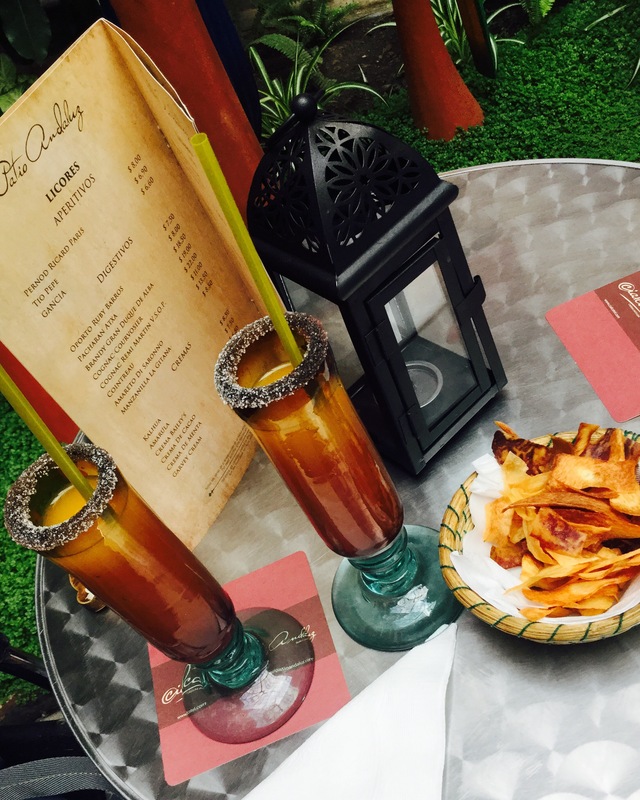 Quito to Abrasprungo Hacienda – a lovely day!! Steam train from Quito to Tambillo ( rest place). A visit to a Russian owned rose plantation ((Nerado) to see the roses grown specifically for export. Lunch in a beautiful courtyard restaurant – the Roka Plaza – at a table with the guides in the town of fruit and flowers – then the train from Ambato to Urbina. A highlight of the day was meeting the 71 year old “last ice maker” at Urbina. It was 6 degrees outside with a cool breeze but everyone was keen to know his story – as told by guide Sixto. The afternoon’s journey was then sabotaged by the film crew on board who wanted us as extras in a little bar scene with Santiago the barman. Christina was not at all keen. It was a late arrival at Riobamba but there was a brass band playing and film crews everywhere. This is obviously part of a big effort to promote the Tren Crucera and boost the flow of income to the towns along the route. 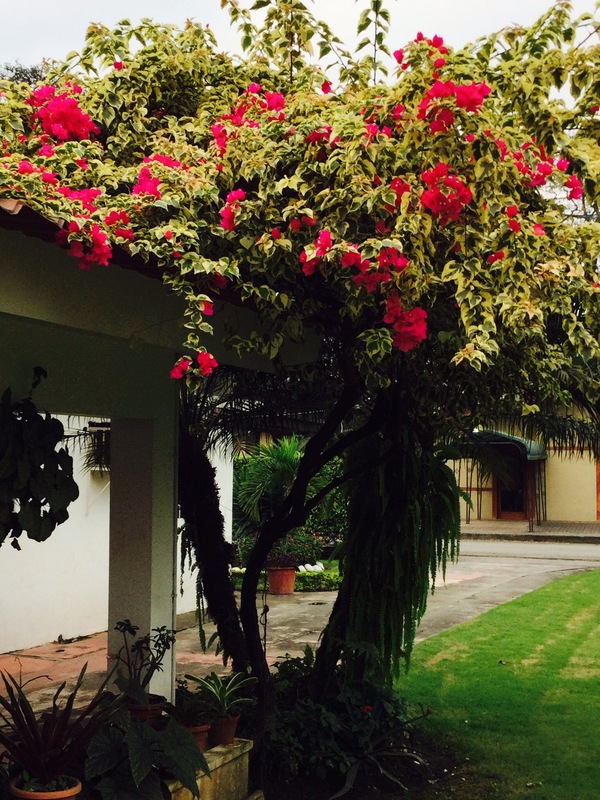 We drove on to the very lovely Hacienda Abrasprunga. The rooms were in separate patio bungalows – ours had a huge picture window overlooking the lawn. A Zumba class was in progress at the station as we took the steam train from Riobamba to Colta. A visit to the first church built in Ecuador, a little market browsing for some then on to Guamote for the huge local Thursday market on the town streets. Lunch was served on the train; then the highlight of the afternoon was riding the spectacularly engineered Devil’s Nose switchback section. Overnight was spent at “tourist” Hotel d’Franco in the cloud forest where the staff were so very keen to please. The last day was full of special surprises. The train took us through coastal plantations of sugar, cocoa, pineapples, balsa, teak and rice. There was a visit to a cacao farm where there was much bragging by the guides about the fineness of Ecuador’s cocoa and chocolate for export. Hacienda La Danesa was a paradise on earth and the chef was applauded by all after a gourmet lunch. 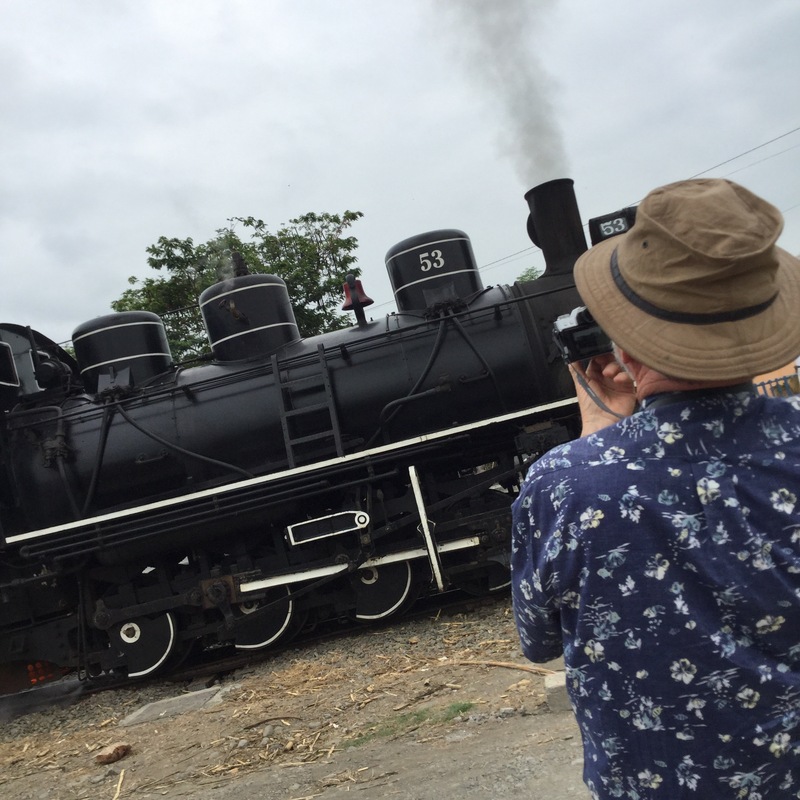 Then followed the unique experience of watching and photographing the historic and restored steam engine replace the diesel locomotive with much whistling and tooting for the run into Duran. Another surprise was cocktails provided by the guides in the cafeteria car AND a 3 man drum, guitar and pipe band playing vibrant South American music. At Duran our group dispersed to taxis or the bus for hotels in Guayaquil. Back to base at Hampton Inn, 9 de Octubre Boulevard. Oasis in time to upload photos, catch up on sleep and have a lazy weekend. 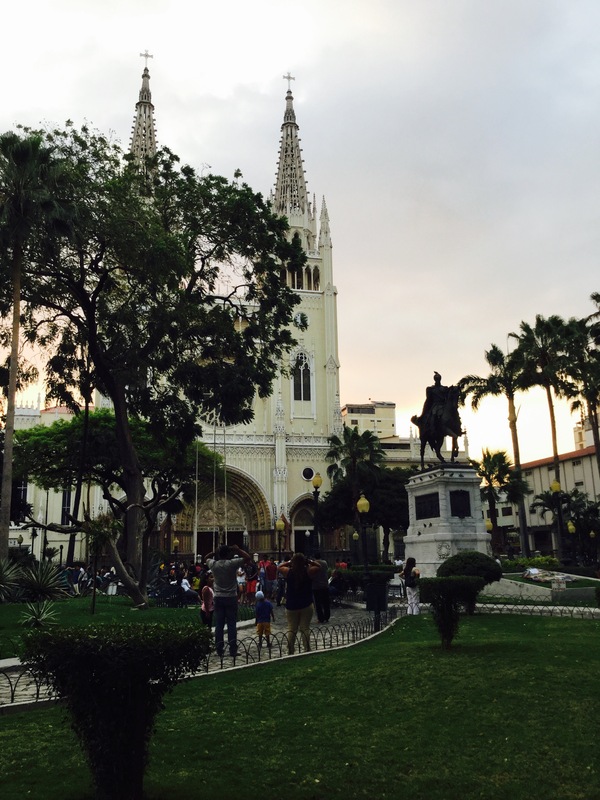 Despite some travel related unsettled stomachs we do manage to have a lovely evening walk to the cathedral and Seminario park to see the iguanas and then to the quite elegant colonial government precinct and back through the warm and noisy Saturday night throng before a late supper. On Sunday for a spot of extra outfitting for the Patagonia part of the trip, a $5 taxi ride delivers us to Mal de Sol to mingle with the families on a Sunday shopping excursion. Our travel mode is suspended as the work part of our trip commences. We are driven from Guayaquil to San Carlos plantation by Sergio and installed in the guest house. For Graham it is straight to work; for me an exercise in discipline to attempt some study of Spanish. There is no one else here during the day except a rather abrupt houseman so I will have to manage the solitude and the sound of my own voice. A walk in the immediate compound area reveals some residences with flowery gardens, a few pretty little birds and the constant noise, dust and smell of a sugar mill operating 24 hours a day. AND mosquitos! !